Olivia Ekpone likes to make new friends and keep the old. When she was in middle school, she would see her track teammates in the spring and summer, and then wait half a year to see them again. And even then, the older high school athletes would only be seen in the summer time. Now that she is in high school, she gets to see her track club friends at meets almost every week during the winter and spring. She also gets to form new bonds with her high school teammates every day throughout the school year. And what better way to strengthen those bonds than to break records together? She enjoyed seeing her track club friends from all over the county at the Cougar Relays on Saturday, but when she hit the track with her Wootton teammates, wearing sparkling new uniforms for their first large meet, it was all business. She was entered in the 4x1, 4x2, 4x4 and Sprint Medley Relay. Suzanne Falk, Katie Falk, Cally Deppen, Veronica Salcido, Maya Walsh and Ekpone would not only be looking to win each of those races, but to break the meet records and set the bar for the rest of the county this spring. In the 4x200, the Falk sisters held position around second place for the first 400 meters. In lane three, Deppen pulled up even with Gaithersburg in lane one on the third leg. She then moved by her opponent, giving Ekpone a slight lead heading into the final 200 meters. The cushion was more than enough for Ekpone to cruise to the win in a meet record time of 1:45.1. The 4x100 was not quite as comfortable for the Lady Patriots. Gaithersburg darted out to a commanding lead over Suzanne Falk in the first leg. Thomas Johnson then moved by Katie Falk in lane two on the second leg. Deppen may have made up ground on Gaithersburg in the third leg, but they were still in third with Thomas Johnson well out in front by the exchange. Alissa Jewell of Gaithersburg immediately began closing the gap on Thomas Johnson, but Ekpone split between the two teams, making up the gap and building a lead over both with her incredible strength. Wootton finished first with a meet record time of 49.1. Gaithersburg was second in 49.9 and Thomas Johnson was third in 50.1. 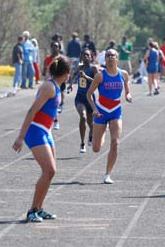 Like the 4x2, Wootton already had a comfortable lead before Ekpone ever got the baton in the 4x4. Walsh finished her leg in third place with a split of 62 seconds. Deppen took the lead in the second leg, splitting about 63. Salcido increased the lead with a 65 split and Ekpone brought it home in 55 seconds. They won in 4:05.7, two seconds shy of the meet record. For the first time in her life, Ekpone led off a relay in the final event of the day, the sprint medley relay. She gave her team about a five second lead over Thomas Johnson with a split of about 55 seconds in the 400. Gaithersburg worked their way up over the 200-meter legs, coming to within two seconds of Wootton. Salcido ran away from Gaithersburg's 800-meter anchor leg with a modest split of 2:26. They smashed the previous meet record by 5 seconds with a winning time of 4:17. Despite their tremendous success in the sprint relays, Wootton took second place in the meet behind the Patriots from Frederick County, the Thomas Johnson Patriots, by four points. Thomas Johnson was competitive with Wootton in every relay, but took control of the meet with well-balanced team that includes strong hurdlers, throwers, and distance runners. Northwest finished fourteen points behind Wootton for third place with the help of strong distance runners and surprisingly good hurdlers. Britt Eckerstrom won the invitational mile in dominating fashion in 5:18. Two out-of-county athletes broke meet records including Emily Vannoy of Thomas Johnson in the shot put and Asha Ruth of Bowie in the long jump. Addie Tousley of B-CC won the Devil Takes the Hindmost race in a time of 25:06. She won by sticking with Aimee Moores for half the race, and then taking off two miles into the race.